A NEW DAY IS DAWNING!!! HE HAS COME TO SAVE PLANET EARTH. 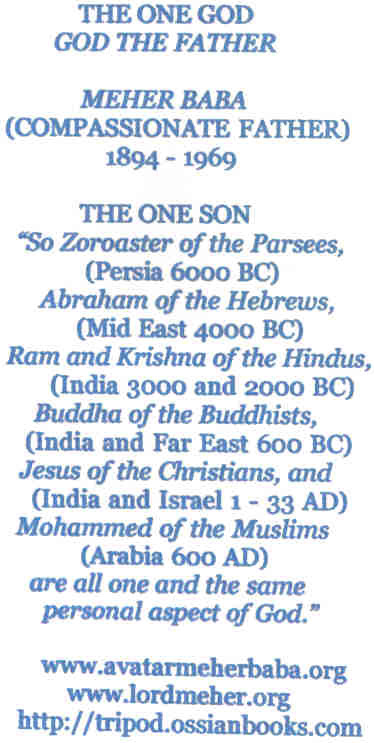 The Prophet Zarathustra lived some 6000 years ago. His master was a Hebrew. He is usually called Zoroaster, which is the Greek translation of Zarathustra. which lead to being religious. The Avesta is their Holy Book. The flame of the fire, is the central element of the religious service, because the flame was the result of the first action of creation by God. "I am the Ancient One and the slave of those who really love me." NOTHING MATTERS BUT LOVE FOR GOD." And he added, "those who love me have not to give up your religion." The Avatar of The Age, Meher Baba, has opened the book on the unseen for all. So, let's look within, where God is living within you, and visit heaven. The path takes the pilgrim through the subtle and the mental worlds while still functioning in the gross world. In the subtle world of energy there are three planes of subtle conscioiusness, planes of power, in the 1st, 2nd, and 3rd planes. The 4th plane lies between the subtle world and the mental world. The 5th and 6th planes lie in the mental world. While in the inner planes the psyche is no longer aware of the gross world yet he continues to function in the gross world. The involution for the embodied soul occurs while in the human form.